As with all Tesla vehicles the Model Y was designed around safety and is in line to be the safest mid-sized SUV in the world by far. It’s low centre of gravity, rigid body structure and large crumple zones provide unparalleled protection. 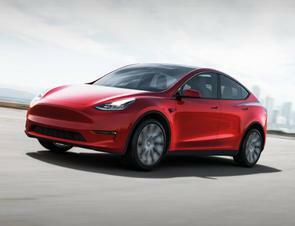 The Model Y is also set to have the longest range of any SUV on the road with a true usable range of 300 miles (483km). Tesla has over 12,000 superchargers worldwide and says they will open six new locations every week. According to Tesla, the Model Y will recharge 270kms in just 15mins using one of their superchargers. Said to have the functionality of an SUV but ride like a sports car the Model Y will reach 0-100kmh in as little as 3.5 seconds. Its all-wheel drive has two ultra-responsive, independent electric motors that digitally control torque to the front and rear wheels. This offers better handling, traction and stability control even in harsh conditions. Being an SUV the Model Y offers plenty of cargo space. And like its bigger sister the Model X it also offers the optional third-row seating to make it Tesla’s second all-electric 7-seater car. An expansive Glass Roof provides more headroom and UV protection for passengers. The interior of Model Y is simple and clean, with a 15-inch touch screen, immersive sound system and an expansive all-glass roof that creates extra headroom and provides UV protection for passengers. There are four spec options for the Model Y; Standard Range, Performance, Long Range RWD and Long Range AWD which expect to start from $39,000 (€34k) up to $60,000 (€53k).